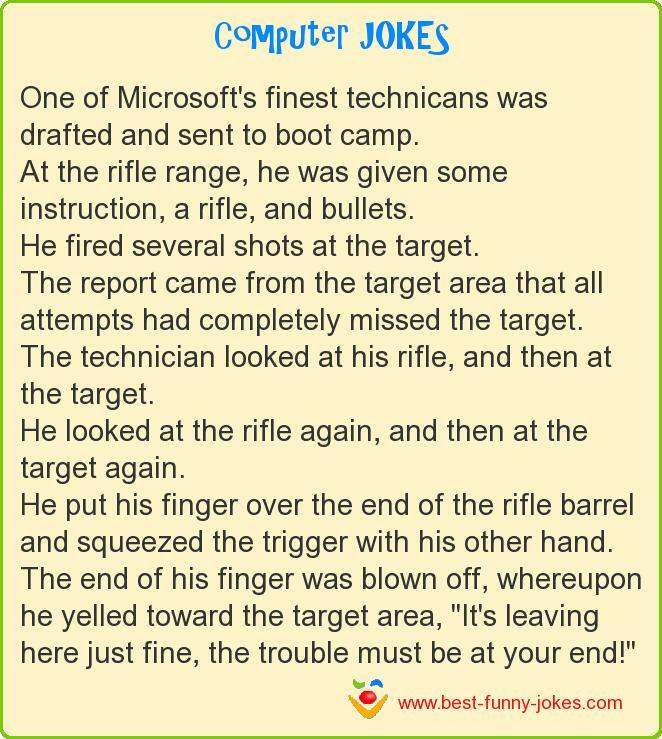 One of Microsoft's finest technicans was drafted and sent to boot camp. At the rifle range, he was given some instruction, a rifle, and bullets. He fired several shots at the target. The report came from the target area that all attempts had completely missed the target. The technician looked at his rifle, and then at the target. He looked at the rifle again, and then at the target again. He put his finger over the end of the rifle barrel and squeezed the trigger with his other hand. The end of his finger was blown off, whereupon he yelled toward the target area, "It's leaving here just fine, the trouble must be at your end!"